This guide will help you find the best chorus pedal out there, especially if you are short on time or if you’re tired of going through all the chorus pedal reviews. 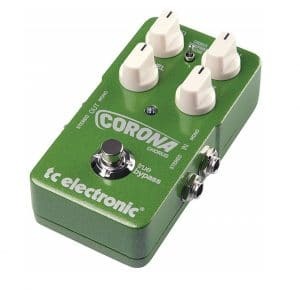 We took the time to look at some of the most critically acclaimed such pedals, and after analyzing the quality of the sound they output and the range of effects they can offer, we found that the TC Electronic Corona should be first in your plans. That is because it’s one of the most versatile chorus pedals, offering a wide range of possibilities to modify the chorus effect. It also comes with a piece of software that can modify the tone that it offers. Furthermore, it has stereo capabilities. If you are unable to find it, you should have a look at the Jim Dunlop MXR M234 pedal, which is next on our list. It is one of the most versatile and user-friendly models on the market. The controls offer more variety than only adjusting the speed, depth, and FX level. You can download a special “voice” for it and that adds much more, helping you experiment. A feature called Tri Chorus will make the pedal have a stereo effect, adding more depth. It is a digital pedal and although the sound is great when using long cables, the quality can be reduced. Being one of the most versatile pedals out there, this model offers a good sound and room for experimentation. This little pedal is built to last. The case is made of metal and surprisingly good looking. Being an analog model, it gets little to no noise in the end sound, and that is also due to the bucket-brigade circuitry, which is very popular. You can adjust the effect as you wish, due to the 5 knobs that can modify the intensity, frequency and more. Performing decently and offering a clear sound, this pedal can have more in terms of a wider and thicker effect. If you want a pedal to remind you of 80’s sounds, this is the one. It also does well on contemporary music styles. The 6 knobs present on this pedal offer you more than usual models do, so much that the resulting effect can be considered more than a chorus one. The animation button is particularly interesting because it allows you to have a doubling effect. The variety that can be obtained with this pedal is impressive, as is the sound quality. Because it’s so complicated, it will take a while for you to discover all of the intricacies of using this model. With these many knobs, you will have the possibility to express yourself as you wish, although it will take a while. Our team has selected some of the most critically acclaimed models and showcased them below. We managed to find them after taking experts’ opinion into consideration, consulting the sales figures for each of them and having a look at what people had to say about them. From the start, you can see that the pedal has 4 knobs and a three-way switch. It also offers selectable effect variations. This simplistic design suggests that the manufacturers want this pedal to be fast to use and intuitive. As similar pedals do, this one offers a specific sound that you will get used to. However, it can also provide different sound options or tonalities. To do that it uses a USB connection which you can utilize to download a specific pedal “voice” from a computer and give this pedal another feel. This is how you can get any sound you want, with the right “voice”. Besides this feature, the pedal offers a standard chorus effect and also one that is called Tri Chorus and this one offers a three-way stereo that adds more to depth, chorus delay, and speed. This pedal is an analog one, and experienced players know that this means a more natural and organic sound. Furthermore, it uses one of the best-known circuitries in the industry, and that is known as bucket-brigade circuitry. These two features packed together mean a quality pedal. In terms of hardware, the pedal offers 5 control knobs and a Mono jack and a Thru one. The device is also very sturdy and looks great. Those knobs control the level, and the amount of chorus you get in the final mix. You can also use them to adjust the rate or the speed of the chorus going into your sound. You can choose how much emphasis you put on your low or high frequencies, and using the depth function you can adjust the intensity of everything. The pedal is great for those looking for an 80’s sound of rock or metal. Most effect pedals give you control over the rate and depth of the chorus. However, this model is designed to offer you better management of the sound that gets out and that is why it offers you 6 neatly packed knobs that let you make a lot of adjustments. The resulting sounds can be considered more than a chorus effect. You have an animation knob that allows you to control the delay of the effect and using this you can achieve a really short delay, like in usual choruses, but you can also increase the delay to obtain a doubling effect and even a slapback one. The animation and dimension knobs can offer you the possibility to adjust the ambiance you want your sound to have. Because there are six buttons and each of them makes the slightest adjustments to the sound, it will take a while for you to get used to them and make everything sound great. Pedal makers have understood the need of effect pedals for bass players too and that is how this pedal appeared. As the greatest models do, this one uses bucket-brigade technology to achieve the sweetest sound. Using this circuitry, the pedal focuses on offering the initial sound upfront and then puts the secondary signal in a supportive spot. Design-wise, the model is a very intuitive one, having the pedals placed in a logical manner. Each of them is clearly marked with the function it provides. You can find the standard intensity, rate, and width that are present on most pedals, but the device offers other features too. Because this is a bassist’s pedal, the manufacturers focused on making the bassist’s role in a song more pleasing, offering a crossover switch. This means that the pedal can help the player have more volume in upper and mid ranges. To provide a more natural sound, this mini chorus pedal has an all-analog signal path and it has 3 simple knobs that control the depth, level, and speed of the chorus. The first two of them are smaller and they could have more suggestive visual indicators to better show the settings. This model gives a good sound to most guitars, as it has been tested a lot. The sound that it offers is a lush, warm and watery one. Because it is simple in design, you can’t really get bad sounds out of it and every setting you input will come out great. This is a very compact pedal and as a result, you can mount it on any pedalboard and it’s also easy to transport. Also, due to its simplicity, it is a very durable model. If you want something that is efficient, although it doesn’t provide too many functions, this is the chorus pedal for you. The sound of this pedal has been appreciated for a long time, such that even famous people like Nirvana’s Kurt Cobain have used it. It provides a quality tone and it offers enough modulation, making the end sound different, better, but it does that while it doesn’t distract you from your playing. In terms of durability, it offers a lot and that is because its casing is made of metal. That, alongside the grey, black, and purple colors give it a distinctive look. You have the possibility to power this device with the help of a single 9V battery or through a 9DC-100 adapter. The controls are simple; there is a depth switch, which controls how much effect the chorus has. Then there is the rate knob that is used to alter the speed of the effect and how swirly the tone becomes. Thanks to these features you can accomplish a variety of effects, including a sound of 12-stringed guitars. While some pedals have had a brief history, this BOSS chorus pedal has been present in the industry for more than 20 years and that showcases how good it is. It is a usual choice for those guitarists looking for a lush effect and a lot of spatial sound in their tone. This pedal has a filter section where you can choose the amount of high and low frequencies that end up in your final mix. You can play with a lot of settings on this pedal. Using the knobs, you can adjust the amount of chorus you get, and you may modify the tone and the speed of the modulation. Additionally, the device is a stereo chorus pedal offering an output for true-stereo depth of sound. The tone provided is generally a gentle one, although you can modify the settings so you can saturate the effect and make it thicker. This pedal works great with guitars, but one impressive feat is that it can be used with keyboards too. Being a device that can be used for almost all purposes, this MXR chorus pedal features a footswitch for allowing the user to switch between effects or for bypassing it. This feature comes with a LED indicator to make it easier to spot the difference when the footswitch is pressed. Being bigger, the pedal requires 2 9V batteries to work, or it can use a Dunlop ECB-004 18V AC Adapter. The construction is solid and it is all painted in yellow, so you will surely see it anywhere it is placed. The knobs are positioned intuitively and if that is not enough, the device comes with an instructions manual that will teach any beginner how to use it. A nice feature is that using the Bass and Treble knobs, you can adjust their respective volume in a range of 12dB. This allows for intense experimentation. As part of a growing micro-pedal trend, this device offers the essentials in a compact form. Its yellow finishing and simplistic design make it stand out. Although it’s so simple, it comes with all the needed features that a player desires. The circuitry is of great quality and the case is very sturdy. Bucket-brigade technology is incorporated into this little pedal, and this makes it popular, as it offers an authentic, natural and high-quality sound. Due to its simplicity, this pedal has almost no noise and it’s also quite light, weighing 1 pound. The only knob present on the device is the Rate one and it influences the speed and intensity of the effect. You can play with it to find the perfect tone, and you won’t have to worry about ruining your mix. Most pedals are too reliant on digital technology but given that this one is based on analog circuitry, it offers the quality needed. 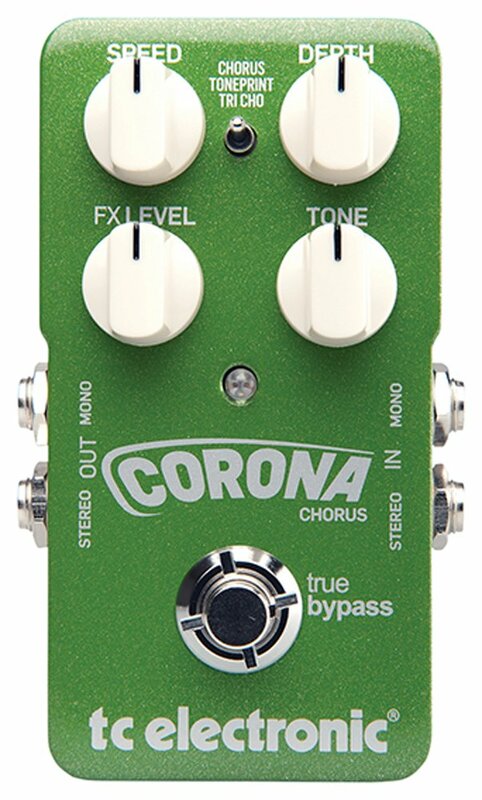 A chorus guitar pedal is a must for any avid guitar player. Offering a lush and colorful sound, a good chorus pedal should also let you make any adjustments you want to it, while still offering quality and avoiding noises. But the sound is not the only important aspect when looking for the best guitar chorus pedal – how easy it is to use, the tone it offers, and how durable it is will make a huge difference. When you first see a pedal, you either like it or you don’t, based on how it looks. Although not as important as the quality of the sound, the design of a pedal is something that influences how you feel about it. There are a lot of models, each suited for a certain kind of guitarist. You can find tiny models, thin ones suited for heavily packed pedalboards, and huge models that won’t even fit in such a rig. Of course, choose the one most suited for your style. Durability, however, is more important than that. 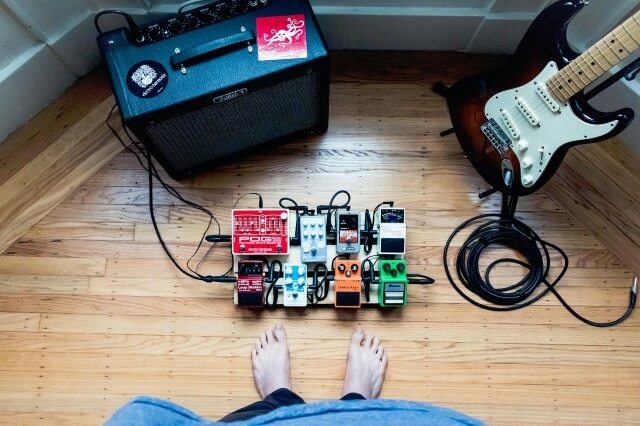 Some players refer to chorus pedals as stompboxes, and the reason is clear – when you use them, you press them with your foot a lot. Thus, it’s important that your pedal is still intact after numerous stompings on it. There are many models made of metal, with well-made buttons that won’t get damaged. Aluminum is a good choice as well, but anything that is less durable than that should be skipped. Although having a pedal with a lot of knobs, buttons, and effects might seem like a great choice, that is not always the case, particularly if you are a beginner. There are perfectionists that prefer adjusting each knob until the sound of the pedal is exactly how they want it to be. On the other hand, some people don’t want to make everything a mess so they get multiple, simple pedals, each of them providing a certain effect. Fortunately, there are pedals for both kinds of people. If you’re not so experienced, you might rely on the chorus effect heavily, as it helps you fill in the gaps with vibrato and delay. Check out songs with chorus pedal in them to learn more. An easy-to-use pedal is not only good for beginners, but it’s also a good choice for any player because it simply lasts longer. Having fewer components, it tends to break less often. Furthermore, when a manufacturer produces a simple pedal, the focus is put more on the quality of the sound, than on the complexity of the effects. If you analyze a Fender chorus pedal you will notice that. On the other hand, having a pedal that allows you to modify more than the basic settings, will allow you to get a more diverse range of sounds and effects and will let you experiment more. Experienced players will benefit a lot from a pedal that offers a variety of effects and a quality end sound. There are certain features that every chorus pedal should have, and there are others that aren’t as important and are mainly present to allow the user to have more diversity in the sound. Generally, chorus pedals will have a Rate knob on them that controls the speed of the effect. If this knob is the only one present, it will also have an influence on the intensity of the effect present in the mix. The Depth knob does that job, in models where both of these knobs are present. Some pedals have a couple of other knobs on them that affect how much of the low and high sounds can be heard. These knobs can modify the volume of low or high frequencies, adding or reducing it by several decibels. Most often, there is a bypass button that lets you make the pedal heard or not at a certain time. Although not a setting that can be modified, some chorus pedals come with the possibility to offer a stereo sound. For the best result, you need two amplifiers for such pedals. Generally, any pedal that offers more than these features can be considered a processor. Professional pedals are meant for those that require all the additional features and know how to use them. Beginners can do better on simple pedals. Recently, there have been more digital models coming into the market. Such a device offers the advantage of being a cheap chorus pedal and having a variety of tones to choose from. Additionally, the sound that they produce is brighter. On the other hand, an analog chorus pedal is a classic choice, although requiring a bigger investment. Analog pedals are good at putting out the sound with a very low noise level. Technology like bucket-brigade circuitry makes the analog models sturdy and lets them output a quality sound for a long time. Its tone is a warm one and that is why it’s preferred by those looking for a classic sound.